“My name is Clementine and I am 27 years old. I have two children, ages 11 and 13, and the younger child lives with me. When I was a small child, my father killed my mother. He was put in prison for several years and released shortly before the 1994 genocide. With my mother dead and my father in prison, I lived with my paternal aunt until I was 12 years old when she made me leave to work as a “house girl”. I lived with different families in Kigali and life was very hard. My father is still alive but I have not forgiven him for killing my mother. Also, he refused to give me any information about my mother’s family until 3 years ago, when I found out that they were all killed during the genocide. I discovered that I was HIV-positive one year after the birth of my first child. Her father infected me. I never had the opportunity to go to school and was unable to read or write until last year when I took the 6-month literacy and numeracy program. Now I can read and write some words and I can count money. I know how to manage a cashbook, to save money and to limit my expenses because I keep a record of them. 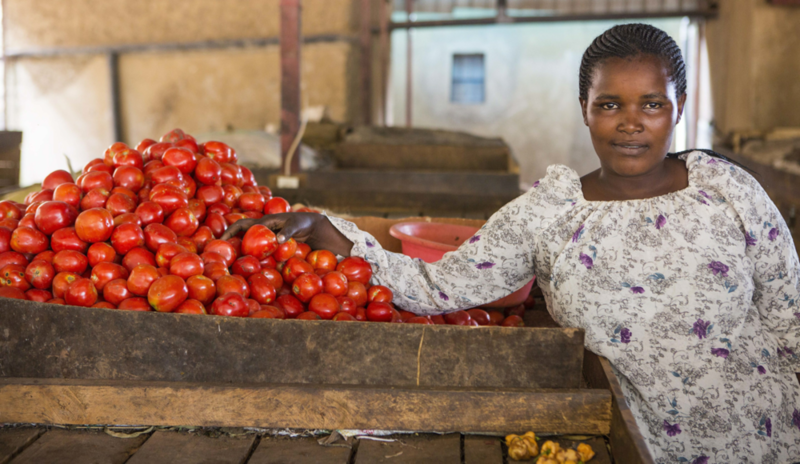 I received a loan from Hands of Mothers and now I am a seller of tomatoes with a stand in the Gatsata market. I am a “big” seller with many regular customers. Now I can pay rent for a good house and health insurance for my children and me. We have good nutrition and I am able to pay my children’s school fees. Today, my health is good because of WE-ACTx and Hands of Mothers. I am able to take my medication because my business is successful and I can eat well. Before, I had many problems that were affecting my health. “My name is Francine Mukarugwiza and I am 32 years old. I am not married yet and I don’t have any children. I have 3 sisters and I live with my older divorced sister in Nyamirambo, Kigali. I support my 2 younger sisters and myself. I am an orphan, my parents died in 1994. Since I was a little girl I lived with many difficulties. I was not able to continue going to school and I didn't have any skills. I was 16 years old when I was raped and became HIV positive. I am alive today because God led me to the WE-ACTx clinic. Before I discovered WE- ACTx, I was thinking that I would die very soon. But now, I am healthy and able to work everyday. I am also able to go church; it is my passion. A few years ago, I was chosen to go to New Hope Academy for one year to be trained as a tailor. Hands of Mothers paid all the fees, and also for my transportation, food and expenses. They also supported me to do a 3-month internship at the INEZA sewing cooperative. I worked hard and I was the only intern hired by INEZA because of my discipline and good skills. It is hard for me to believe how good my life is now! I am healthy and able to work every day. I am earning a very good salary – it is like a dream for me. I help my sister to pay our rent, and I pay health insurance for my young sisters and me. I also pay my sisters school fees and I am proud that they will be able to finish secondary school. Before I started training and working as a tailor, it was difficult to eat even 1 meal every day. Now I can buy nutritious food and eat well to protect my health and my strength. “My name is Immaculee, and I’m 23 years old. I have been supporting myself for several years now, even paying my own school fees. Anything I need, I have to provide for myself, whether clothes, books, or personal items. Before I came to WE-ACTx in 2012, I sold local sorghum beer from my house. But on coming to WE-ACTx and working as a peer parent, I have been able to support myself financially and meet my basic needs. As a Peer Parent, I take care of the children, help them learn how to take their medicine, and check on their health. When I see how their health is improving, I feel proud of my work and my contribution to their wellbeing. My health has also improved since being at WE-ACTx, and I am one of 20 patients who have the best health indicators at the clinic. In her role as a Management Associate for Hands of Mothers, Nancy works with some of the loan recipients and with the Ejo Hazaza Cooperative. She is responsible for managing the overall work of the cooperative, and for assisting the members with financial management, marketing, completing orders, and running their cooperative democratically. “I am 22 years old, and live in Kigali with my Aunt and her 9 children and grandchildren. I was born here in Rwanda in 1993. My father died in the genocide and so my mother and I lived together and took care of one another. She worked extremely hard to make sure that I could study in a good school and become knowledgeable about the world. She was raped during the genocide and contracted HIV. She didn’t know for a many years that she had it—and so I contracted it too because she breastfed me for a long time. My mother died in 2005. She spent the money she had on my school fees instead of on the medication she needed. At the time, I didn’t know I had HIV, even though my mother had long suspected it. I have had every kind of disease and illness possible—tuberculosis, flu, malaria - you name it! Finally, a relative of mine took me to get tested, and it was confirmed that I have HIV. The hospital I got tested at referred me to WE-ACTx. I was in primary school at the time, and WE-ACTx helped me to find an organization that would pay for my secondary school education. WE-ACTx was also always there for me whenever I had a problem. I have had a lot of opportunities that others don’t have. I had been doing various temporary jobs throughout, including working at a restaurant and small store, when WE-ACTx asked if I would like to join the Dutete cooperative as a member. I also became a Peer Parent in 2013, and then an intern for Hands of Mothers in 2014. I like leadership, and I also like that these jobs allow me to forget my problems at home and live in another world outside of my house.